BELLVILLE — Village leaders agreed to make some changes in where budget money has been placed in Tuesday’s council meeting, where there was talk about the pluses and minuses of development and expansion. Council was told that the benefits of a tax levy passed last November in support of the Bellville Police Department would have impacts, both good and bad. Fiscal director Brigette Gatton told council the “levy line” had been reduced by $10,000, leaving $1,262 as a reserve going into 2019. Council agreed to “re-allocate” funds so that expenses within the Police Department could be covered. Council member Jason Guilliams said there was a five year high in overtime within the police department. He said people should know “what are the triggers” for such costs. Council member Stephen Edwards said activity along State Route 97 West requires attention. Jason Potes, also on council, said there also have been more auto crashes and drug problems. He said hearing Police Chief Ron Willey talk about police activity left him wondering why Willey wasn’t “more animated” in describing the handling of police activities. Potes said the village needs to “hammer the standing up nail down,” and that applies to the over-time situation. Mayor Teri Brenkus said officers have been trying to take advantage of opportunities available from Ontario and Lexington, where they can use and learn from items those forces have. But, in order for officers to do that, they have to be receive overtime pa7 to participate. The department has not scrimped on police radio equipment and police vests, Brenkus said. It is not unusual for money “lines” within a budget to have to be moved in the course of a year. The “re-allocations” in this instance provided $2,000 to pay for overtime and $1,500 to go into the general fund. Gatton moved $4,500 into the gasoline fund for the police department. The original amount specified for gasoline had been the same amount as last year, but gasoline prices have gone up, said Gatton. Gatton also had moved $4,000 to the budget line for maintenance and repairs. Council agreed to allow Trebel LLC to expand its offering to do aggregation work on natural gas rates to include a proposal to also do work in electricity rates. Scott Belcastro of Trebel, an energy consulting firm, was at council, and said his firm could include information on its proposed handling of electricity. 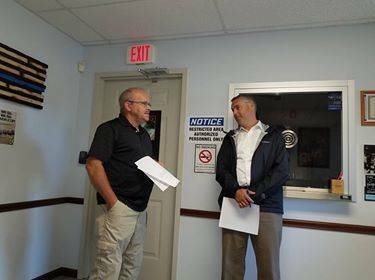 Village solicitor Jeff Mussman said there is nothing which would preclude the village getting information from another group even though there is an existing contract with someone else. Police Chief Willey told council thatwith school starting, two police officers have been assigned to the Bellville Elementary School as monitors,who can be there to help children and staff. The two officers sharing duties in that enterprise are Kaylie Hall, who will be at the school three days, and Don Wallis, who is assigned to that duty for two days. The officers are working with an interim principal at the school, working in place of Kirsten DeVito.